Stadt Neuwied: UNESCO World Heritage Site: "Limes"
UNESCO World Heritage Site: "Limes"
In 2005 the German stretch of the frontiers of the Roman Empire, known as the Upper Germanic-Raetian Limes was inscribed on the UNESCO list of World Heritage Sites. It joins "Hadrian's Wall" in Great Britain, inscribed in 1987, as part of the transnational property "Frontiers of the Roman Empire". The Limes stretched from Rheinbrohl on the Rhine in the municipal district of Neuwied to Regensburg on the Danube. The frontier was secured by ramparts, walls and ditches, and watchtowers and forts of varying sizes. North of the Neuwied district of Oberbieber, watchtower 1/37 has been reconstructed. In the area called "Sandschleife" in Hainbach Forest parts of the Limes are well preserved and its course can easily be followed in the terrain. At the site of watchtower 1/40 "Auf der Alteck" a very rare example of hexagonally shaped tower foundations has been excavated. The sites of the two forts in Neuwied lie in the districts of Heddesdorf and Niederbieber. Heddesdorf, the smaller fort, was built first. After it had been abandoned, the larger fort at Niederbieber was founded at the end of the second century AD. The Niederbieber fort covered an area of more than five hectares (12.35 acres) and was probably the base for two garrisons. Numerous archaeological finds, including the famous draco standard head, suggest that cavalry were stationed there. The area of the fort has been built over with modern-day housing; however, the foundation walls of the baths in the fort have been preserved. They can be accessed at all times. Roman finds from the two sites at Heddesdorf and Niederbieber are exhibited in the Roentgen-Museum (municipal district museum) in Neuwied town centre. Please enquire about the opening times of the exhibition before travelling to avoid disappointment. 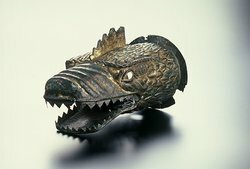 The draco standard head (Photo) is on display at the Landesmuseum in Koblenz-Ehrenbreitstein. The Limes Road follows the Roman frontier and links all major places of interest.